Competition among the leading players in the global market for atomic layer deposition equipment is expected to grow in coming years. Applied Materials, Inc., ASM International N.V., and Tokyo Electron Ltd. hold more than half of the share in the global market, finds Transparency Market Research (TMR) in a new study. Among these three ASM International N.V. has emerged dominant. These companies are putting efforts to develop advanced technologies and make innovations. Some of the companies in the market are also undergoing regular technological upgradation to keep pace with the changing market. As per TMR, the global atomic layer deposition (ALD) equipment market is projected to reach a valuation of US$ 8.58 bn by the end of 2024. During the forecast period between 2016 and 2024, the market is estimated to expand at 29.4% of CAGR. Based on application, semiconductor and electronics held the dominant share of 87.4% in 2015 in the atomic layer deposition equipment market. The increasing use of ALD equipment in automotive, industrial, and medical sectors has boosted the demand for ALD equipment from semiconductor and electronics segment. As per the regional analysis, Asia Pacific is leading the global ALD equipment market owing to rising use of this equipment in core industries. In terms of revenue, this region holds 57.2% in the global ALD market. The contribution of atomic layer deposition equipment in nanotechnology has increased widely due to technological advancements in the ALD equipment. Reliability, performance, and scalability are the major technological advancements that made this possible. Furthermore, these technological advancements have increased the use of ALD equipment as fabrication tools and manipulation in nanotechnology that are expected to grow in coming years. Moreover, growing use of atomic layer deposition equipment in energy devices and in semiconductor and electronics is estimated to fuel the demand for ALD equipment in coming years. Increasing research and development activities in ALD technologies will further boost the demand for this market. In addition, rapid expansion of industrial sector in emerging economies will fuel the demand in the atomic layer deposition equipment market. Growing government subsidies and availability of cheap labor will help the market to flourish during the forecast period. On the flip side, there are certain restraining factors that may hamper the growth of the market. 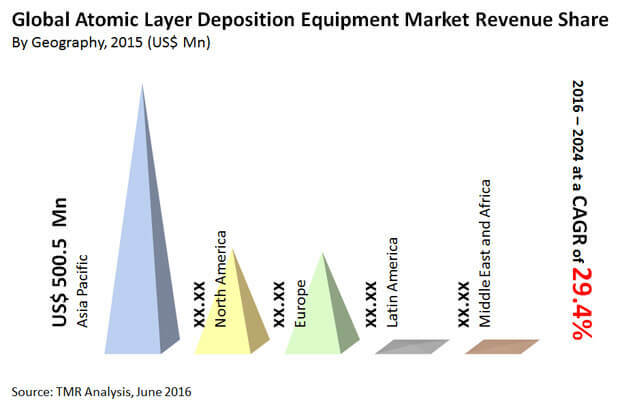 Strict export regulations may deter the growth of the atomic layer deposition equipment market. Moreover, high initial investment that is required to obtain atomic layer deposition equipment will also acts as a restraining factor and could limit the growth of the market. Slow deposition rate and lack of availability of skilled labor can restrain the market from growing during the forecast tenure. Nonetheless, rising application of atomic layer deposition equipment in hydrophobic coatings, flexible electronics, and electronic textiles will help the ALD equipment market to gain traction in coming years. Moreover, these applications will benefit the manufacturers in this market to experience high growth opportunities that will help them to keep firm in forthcoming years. In addition, growing global penetration and application of atomic layer deposition equipment will also benefit the growth of the market.